Filipa Sousa massacring an already horrible fado-lite effort, called "The life of mine". It's here but I wouldn't let it trouble you too much. As I'm sure you'll agree we've long been hoping for a return to the 1970's Meditteranean musical collectives the "interventionist style", so imagine my joy when the joke act Homens da Luta came along in 2011 with their classic "The Fight is Joy". However without a hint of sarcasm, here is a joy free zone. "An independent kingdom since 1143, Portugal established its continental frontiers in 1297 and is one of the oldest nations in Europe. In 1415, the Portuguese set sail on an epic voyage that would make them the first to discover the ocean routes to India, Brazil, China and Japan, and at the same time founded settlements on the east and west coasts of Africa. 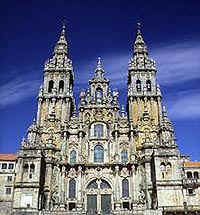 Traces of this worldwide historic presence may be seen as trademarks of the Portuguese genius. The Portuguese language became one of the most widely spoken in the world, and the Portuguese people were privileged for being exposed to so many different civilizations. The vast monumental, artistic and archaeological heritage does witness not only the 850 years of history of encounters with distant cultures, but also the presence in the territory of more ancient peoples (Celts, Suevians, Visigoths, Romans and Arabs)." 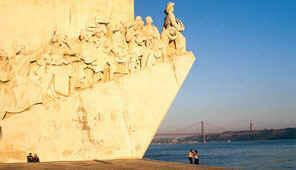 "Lisbon, the dazzling city that stretches along the banks of the Tagus, is an enchanting capital. There is the fortress around which the city originally sprang up, and which is now circled by neighborhoods drenched with medieval charm. Everywhere are fine monuments that bring to mind the great Age of Discoveries, and picturesque houses whose facades are decked with ornate ceramic tiles. 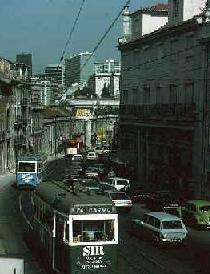 As the dusk turns to night, the yellow electric tramcars continue to wind their way up and down the hills of the old capital, while the sound of traditional Fado songs enlivens many a candle-lit dinner table in restaurant or home." Inmates in a Portuguese prison went on the rampage, claiming their turkey and spaghetti had hairs in it. Around 300 prisoners smashed tables and chairs in the cafeteria at the Lisbon prison. They also complained the turkey they were served for lunch was dark and not fully-cooked. A newspaper reporter who looked at and smelled the meal said it was perfectly normal. He didn't taste it. Local police sent in 20 officers to help prison guards restore order. A former speech writer for Bill Clinton has sailed a boat made from 160,000 corks 165 miles down a Portuguese river. John Pollack sailed the seven-metre-long boat down the River Douro from Barca D'Alva to Porto. Mr Pollack has been collecting corks for 30 years. He had a crew of family and friends for the 17-day trip. He spent two years preparing for it and thinks it's the first boat to be made entirely from cork. Metro quotes him as saying: "This proves that if you have a dream you can achieve it and you don't have to worry about looking silly." He added the trip took twice as long as he expected, saying: "I think this is the only river in the world that flows uphill."